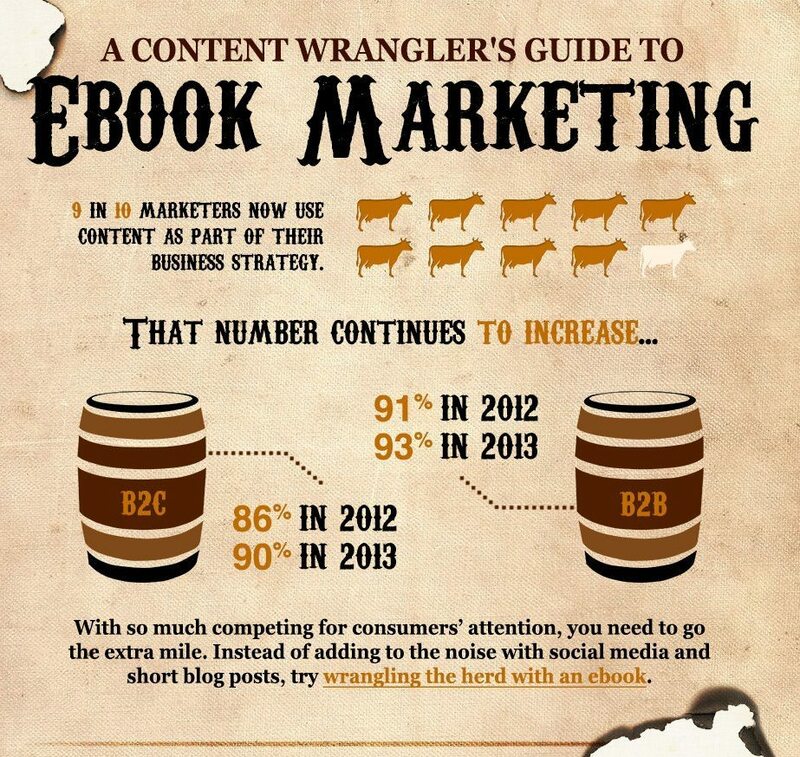 E-books are more than just a nice piece of content to give away to your audience online. If done correctly, e-books can help you create a marketing machine that provides immense value for potential customers, establishes you as a thought leader and drives leads for your business. Like most of you, I’ve downloaded my fair share of e-books. And while some of them have been duds, I’ve also downloaded some amazing ones and happily given my contact information in exchange for the e-book download. When thinking about creating e-books, the key seems to be crafting one that provides value and insight beyond what’s readily available. When you start looking, you’ll begin to notice e-books on blogs and websites everywhere: like Marketo’s Definitive Guide to Marketing Automation, a super-informative guide tailored to the B2B market that they serve. It’s used to generate leads and establish their subject matter expertise around the product that they sell. Or Marcus Sheridan’s Inbound and Content Marketing Made Easy. This one is a great collection of the author’s popular blog posts turned into an e-book to drive leads for his consulting business. More than 17,000 people have downloaded Marcus’ e-book. I caught up with Marcus about his content marketing and he told me that e-books are the No. 1 reason why people join his mailing list. On the priced e-book front, Copy Hacker is a great example for monetizing e-books. The team there has built an entire business out of distributing them. I was so intrigued that I purchased their Guide to Headlines, Subheads & Value Propositions and haven’t had one moment of buyer’s remorse, mostly because the content is just plain good. At our company, Placester, e-books are a big part of how we drive exposure for our business. They are a small gift that we can use over and over again to provide value to folks that just might be in the market for one of our websites. They become a conversation starter. To see what I mean, search “Being a Real Estate Agent” in Google and most likely we’ll show up in the search results. The Beginner’s Guide to Being a Real Estate Agent e-book that shows up gets downloaded almost 10 times a day, and has been every day for the last two years. It’s become so popular that we’ve updated the content twice to make sure it delivers on its promise of being a valuable resource for new agents. If you look closely, you might notice that there’s no hard sell in our e-books. This is an important point. It’s the difference between being perceived as a giver or a taker. First impressions are precious — they help us establish trust and provide an opportunity to build relationships. E-books done the right way help you do that. If these examples aren’t enough, take a good look at the infographic we put together and start making plans to include e-books into your marketing mix. I’d love to hear about your personal experiences. Have you seen any fantastic e-book examples? Please leave a comment below or find me on Twitter at @sethstuff.